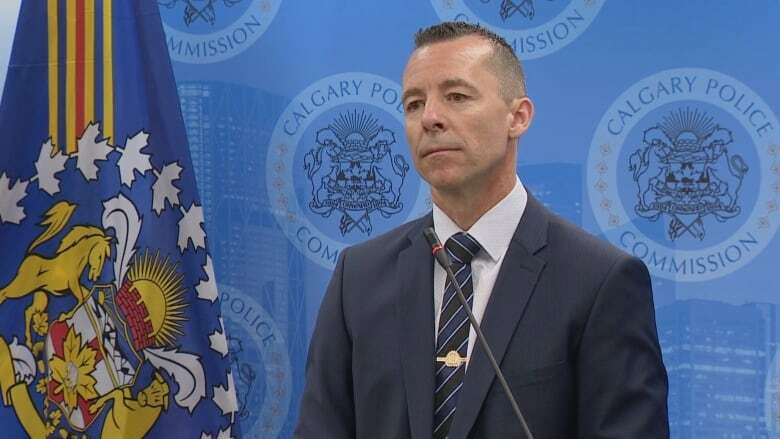 Incoming police chief Mark Neufeld says boosting morale and changing the Calgary Police Service's culture will be immediate priorities as he takes over the top role amid ongoing concerns about harassment, bullying and gender discrimination. "In terms of the concerns that have been raised in the past by our employees, you can be assured that I am aware," Neufeld said Tuesday. "And I intend to learn more — much more, in fact — about those particular challenges." 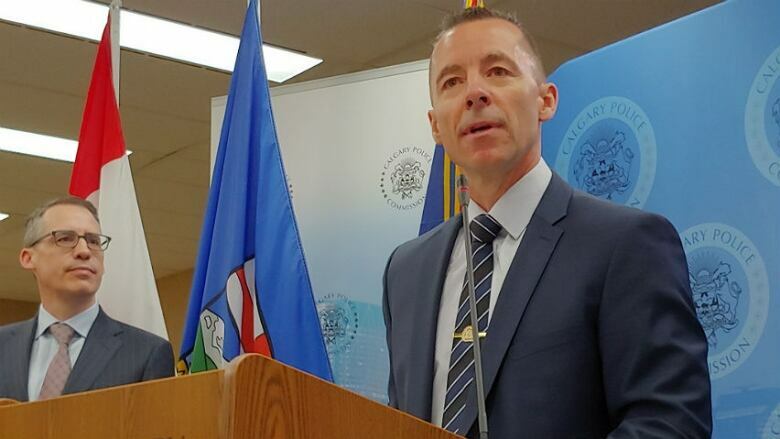 The Calgary Police Commission announced Monday that Neufeld had been hired to replace former chief Roger Chaffin, who retired 2½ years before his contract was set to expire. Chaffin told CBC News last month that he expects the biggest challenge for his successor will be getting everyone on board with HR reforms he had begun to chip away at during his tenure, including a core group of people at the top of the organization who are resistant to change or at least unenthusiastic about it. Neufeld said he planned to address morale issues by taking a "people-first approach." "At a foundational level, policing is a people business," the incoming chief said. "The CPS delivers very important programs and services to people — the people who live, work, learn and play here in Calgary — and we deliver that through people — our people. So it's vital, then, that we engage, develop, lead and support our employees to ensure that they are capable and confident and that they remain healthy. That will be my immediate and ongoing priority." Mayor Naheed Nenshi welcomed the new chief as "exactly the right person for what we are looking for, right now, in this community." While much attention has been focused on police morale lately, the mayor also noted that the city remains relatively safe and Calgarians maintain a high degree of trust in their police service. 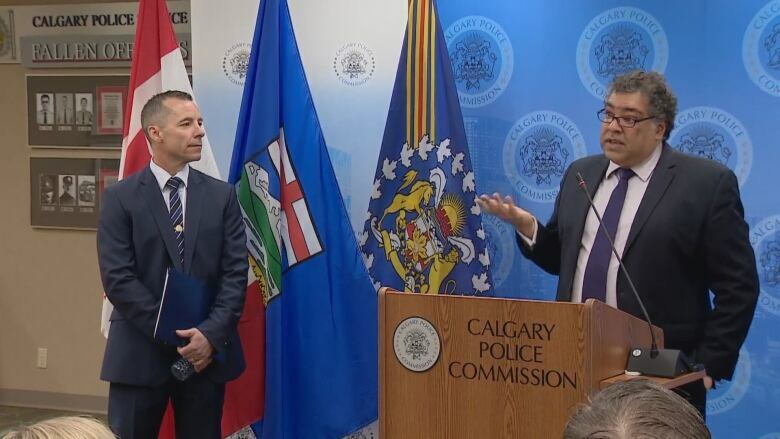 "The women and men of the Calgary Police Service do not have an easy job, and every single one of them works incredibly hard every single day," Nenshi said. "And, as a result, Calgary remains one of the safest places in the world." In 2017, under Chaffin's leadership, the police service undertook a human resources overhaul after more than a dozen female officers came forward with harassment and bullying complaints. Last September, the new head of HR — who had been hired to tackle the toxic workplace allegations — announced she was resigning after just a few months on the job due to what she described as dictatorship-style leadership. Asked how he intended to fix things, Neufeld said he would start by listening closely to officers and civilian staff. "I spent much time yesterday and I will spend much time in the future getting out and being visible in the service and listening to issues and obviously reacting to issues," he said. As for specific changes to the working environment, he said that's still to be determined. "There's no one lever that fixes morale," he said. "There's a bunch of different things that a bunch of people have to commit to doing — and commit to doing over a long period of time." "I can tell you what it's not going to be," he added. "It won't be ping-pong tables and latte machines. We're talking about culture change in order to really, meaningfully address morale. So I think that goes back to the purpose and the values and getting agreement about what kind of organization we want to have, moving forward — and understanding and respecting the diversity of the organization." Neufeld is currently the chief of police in Camrose, Alta., and also serves as president of the Alberta Association of Chiefs of Police. He spent 24 years previously with the Edmonton Police Service. He also holds a master's degree in criminology and police management from Cambridge University and helped implement the Alberta Serious Incident Response Team (ASIRT), the province's police watchdog agency, which was founded in 2008. Neufeld will take over from interim chief Steve Barlow no later than June, according to the Calgary Police Commission. "We found a gem in our own backyard," commission chair Brian Thiessen said. "Mark Neufeld is one of the most respected, experienced and educated police leaders in Alberta."